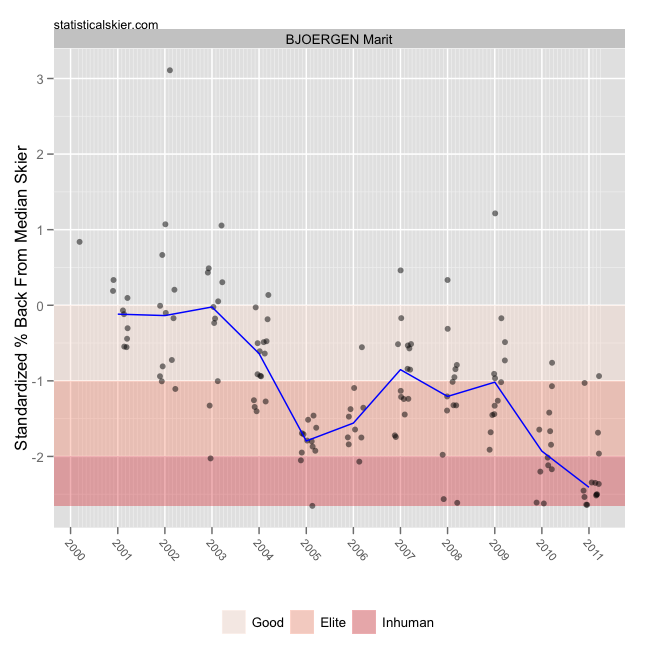 Statistical Skier : Can Bjørgen Repeat Her Dominant Performance? As a stats guy, when I see extreme events I tend not to expect them to repeat themselves. The general principle here is called regression to the mean. Extreme events are just unlikely, so it doesn’t make sense to expect them to happen repeatedly. From a numbers perspective, Bjørgen’s season was pretty much unrivaled, so if I were a betting man I’d wager that she won’t be as dominant next year. At the very least, I wouldn’t expect her to win by a consistently large margins over the field, even if she actually wins nearly as many races. But you never know! Fredriksson’s 2003 campaign is the most obvious example here. Sommerfeldt had great seasons in 2003 (second place in the WC overall) and 2004 (first place) but couldn’t sustain his 2004 performance. 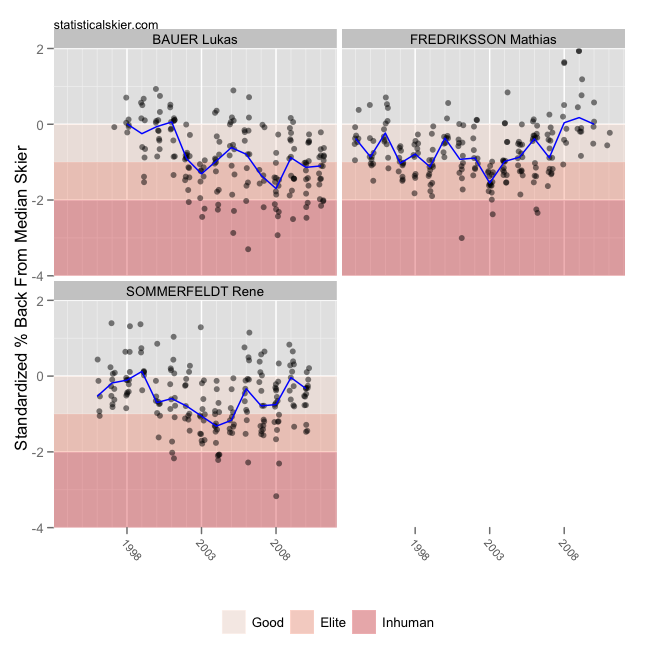 Similarly, Bauer had an amazing season in 2008. Posted by Joran on Friday, September 16, 2011, at 6:00 am. Filed under Analysis, Cross Country. Tagged bjoern daehlie, lukas bauer, marit bjoergen, mathias fredricksson, rene sommerfeldt, vladimir smirnov. Follow any responses to this post with its comments RSS feed. You can post a comment or trackback from your blog.